Callender's photographic landscapes of the oil rigs and other icons that represent the industry are remarkable and striking images, full of color and drama. 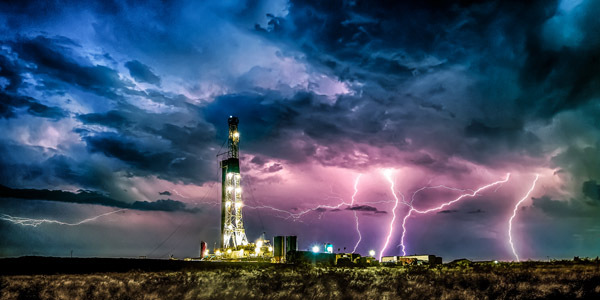 As the rig pierces the vast, stormy sky, the clouds offer up a fury of lightning bolts, slicing across the panorama. A combination of man, machinery, and the elements, in an amazing piece of art that captures the pulsating energy of the scene.